A VoIP phone is a telephone system that uses the Internet to complete the phone call. Delivery can either be completely via the Internet, such as phone calls from one VoIP customer to another (especially in the case of two customers using the same service), or handed off to the traditional phone system at some point, like calls to landline or cellular numbers from a VoIP phone. VoIP stands for Voice over Internet Protocol, and its name describes what happens in the process of placing a VoIP call. While you may still use a traditional phone in the VoIP calling process, your voice is transmitted from the phone to some type of device that digitizes it to be sent as a data packet over the Internet. Typically at some point the data packet is reconverted into a protocol transmittable over regular telephone line to complete the call. A VoIP call may not start over a regular telephone; it may instead start within an app on a smartphone, a program on your computer or a special VoIP phone. In that last case, your voice is captured digitally instantaneously. You’ll need a special adapter to connect to your phone or a special VoIP phone to place a VoIP call. The adapter may connect to your computer, directly to the Internet via your router or both. Placing calls directly from your computer or a mobile device requires the installation of your provider’s specific application. 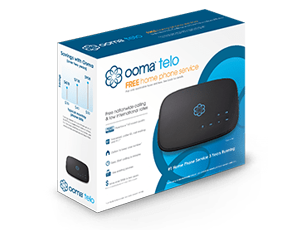 In Ooma’s case, at a minimum you’ll need the Ooma Telo, but we recommend purchasing Ooma Telo and the HD2 handset package to get the best-quality calls. 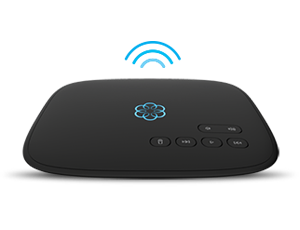 The HD2 handset connects to the Ooma Telo base station wirelessly and can be placed just about anywhere in the house. You can also connect an existing analog phone to the Ooma Telo via the analog phone jack. A broadband connection is required to place calls. While a super-fast connection is not necessary, Ooma requires a 384 kbps connection, which is equivalent to a typical DSL connection, in order to operate properly. Nearly every cable Internet connection should have sufficient bandwidth to use VoIP. Try this broadband speed test if you’re unsure. You can use your VoIP phone in most cases to call just as you had with a traditional phone. There are some differences in how you might be billed, however. While your traditional phone service provider may charge you extra above your monthly service charge to call outside your local area, most VoIP providers — Ooma included — give you free or deeply discounted calling within your home country (and sometimes elsewhere) and to numbers also using your VoIP provider’s service. International calling is also typically possible, and at rates that are a fraction of your traditional telephone provider’s. For either domestic or international numbers, you’ll hear a dial tone when dialing, and dialing the phone number itself is no different. Early critics of VoIP pointed to the issues the service had when it came to making emergency calls. This was because prior to 2005, there were no regulations on how VoIP calls should be handled. Now, you’ll be asked to enter emergency contact and home address information to ensure this information is transferred to the 911 call center in the event of an emergency — so in most cases, emergency calls are not an issue. New Ooma customers will complete this step during the setup process. Keep in mind that if you’re traveling with your VoIP phone, you’ll need to update this information to ensure the right address is transferred to the call center. In the event of a power or Internet outage, be aware that your 911 service will not work unless it has a backup battery source, such as a UPS or generator. Ooma allows you to have all calls automatically forwarded to a mobile phone in the case of a power outage. I didn’t know that VoIP stands for Voice over Internet Protocol. I guess the internet is a powerful tool for all types of communication. I bet that’s really useful for businesses since it could make their budgets more efficient and provide documentation of phone calls.